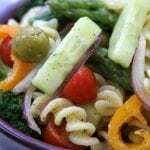 An easy, simple, light and refreshing pasta salad that both little ones and adults will love. Perfect way to get your veggies in. Prepare noodles of choice to al dente, following instructions on package and boiling in heavily salted water. Wash and cut broccoli into florets. Place in colander and when noodles are done drain over top of broccoli. While water for noodles is coming to a boil prepare vinaigrette. Place olive oil in large mixing bowl. Whisk in lemon juice until emulsified. Add garlic, dil and salt. Stir well. Prepare cold veggies (cucumbers, tomatoes, onion, & olives) and set aside until noodles are cooled off to almost room temperature. Once noodles are done cooking drain over top of broccoli florets. Add to vinaigrette and stir well. Let sit for about 10 mins, cooling to almost room temp and add cold cut up veggies. Toss well. This recipe tastes great fresh or chilled.